Circa 1983 I sat in Mr. Garcia’s math class at Goddard Junior High in Midland. I wasn’t much of a student until well into adulthood, so many hours of that class were spent staring out the window at the Goddard Rocket. 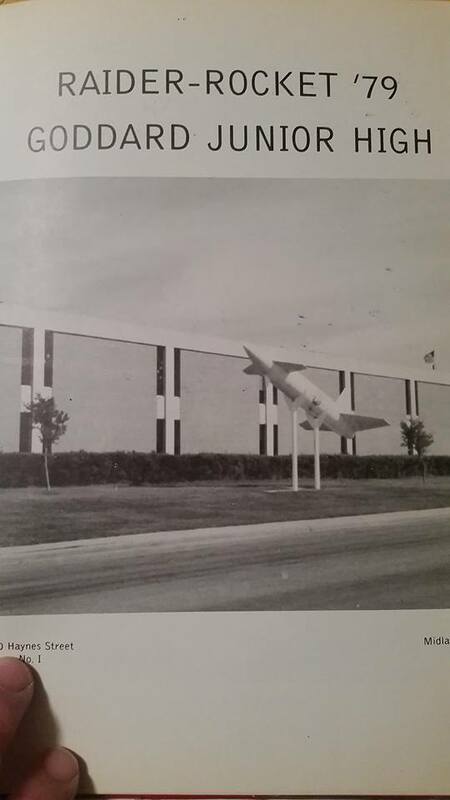 It was on the south side of the building in those days, painted white with an air force emblem on it. The second floor classroom put me close enough to the rocket to see rivets, hinged control surfaces and access panels. She was definitely real and definitely guided. As a young rocketeer I learned that forward fins only worked on guided missiles. 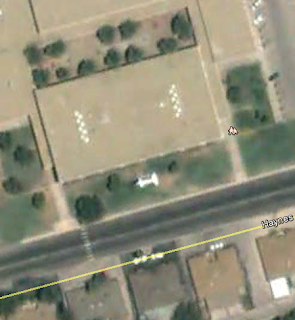 I almost burned a vacant lot to the ground with a model rocket while familiarizing myself with stability. Years later, I’m still a rocket builder. 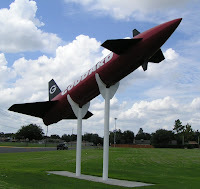 Cold War era machines fascinate me more than ever, and the Goddard rocket was moved to the southwest corner of the football field. It was nicely painted with school colors and affixed to the same display mount. While I was researching info for a scale model rocket project, I ran across Andreas Parsch. He's the owner and operator of DesignationSystems.net, a website dedicated to collecting information on rockets, drones and missiles that I used for research. I went through his site and couldn’t find a match for the Goddard rocket. I sent him an email photo and he quickly returned an answer along with a link to a page on his site I’d overlooked. The Goddard rocket is GAM-63 RASCAL ( Guided Air-launched Missile, RAdar SCAnning Link). It was an early 1950’s nuclear capable weapons system designed to be launched from the B-36, B-47 and B-52. 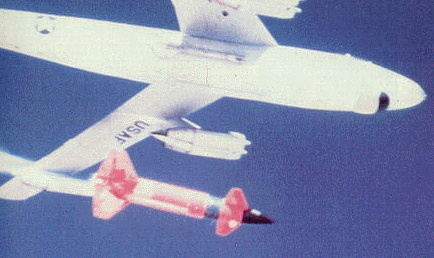 The “captive carry” launch system meant that it had to be attached to the underside of the bomber. The bottom fin folded so that the weapon could be slid under the mother ship on a dolly, so our local example must have lost this part somewhere in her travels. The RASCAL didn’t work out so well for the Strategic Air Command. She was expensive, burned toxic fuels and the performance was problematic. With one successful test flight out of 65, she makes a better giant garden gnome than a tactical weapon. Around 136 were produced and were either tested, destroyed or pressed into junior high mascot service. MISD probably paid nothing for their rocket, but I’m sure a study of the development costs would compare to a gold life-size bust of Dr. Goddard himself. I’d like to know more about how she made it to the football field. I always loved static military displays as a kid. I miss the Odessa American Legion’s tracked artillery piece and Hawk missile and Corpus Christi’s guns under the harbor bridge. I suppose old military gear is no longer a fashion statement, but it still impresses me. Fortunately there’s an old practice bomb case from Midland Army Airfield that serves as a bird condo in my back yard. I will update this blog with any new info that comes to me about the rocket's history. If you have any info, please comment or e-mail! Who is this "Matt" person anyway?